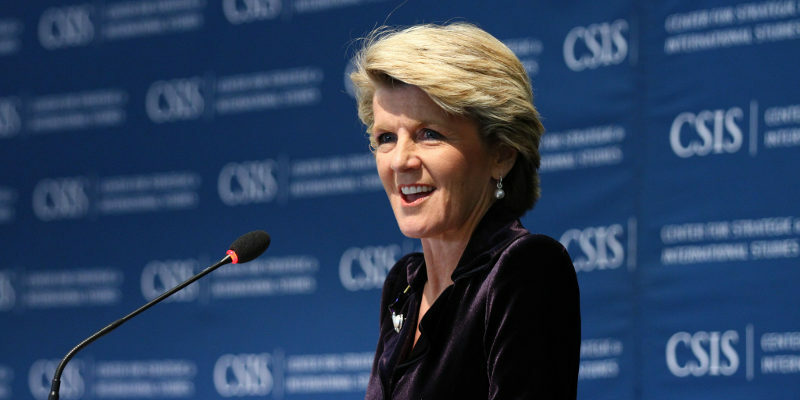 Australia’s Foreign Minister Julie Bishop attended Washington for a series of meetings on security and terrorism. But equating climate change as a security threat was just too much for Julie Bishop, evading a journalist’s probing question and replying with some untruthful spin on the Government’s climate change ‘good story’. This story was originally published in an earlier version on John Englart’s own climate blog. Bishop was invited to attend President Obama’s 2015 State of the Union address by House of Representatives speaker John Boehner. The best scientists in the world are all telling us that our activities are changing the climate, and if we do not act forcefully, we’ll continue to see rising oceans, longer, hotter heat waves, dangerous droughts and floods, and massive disruptions that can trigger greater migration, conflict, and hunger around the globe. The Pentagon says that climate change poses immediate risks to our national security. We should act like it. So what was Julie Bishop’s response? She answered several questions in a 11.00pm doorstop interview, mostly focusing on security and terrorism, Abbott’s leadership and whether he is toxic with the electorate. 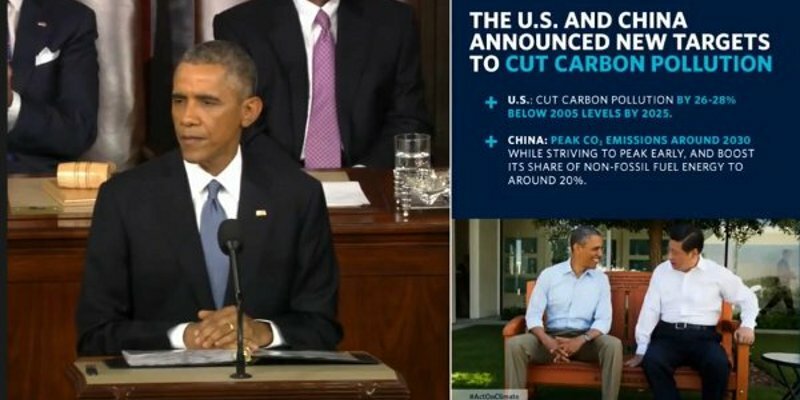 JOURNALIST The President spoke about climate change at length and in particular how it poses a risk to security. Does the Australian government agree with the sentiment that climate change poses a big risk to security? JULIE BISHOP We have a very good story to tell in our actions to deal with climate change. Not only have we committed $200 million to the Green Climate Fund but through our Direct Action Plan we are on track to meet our 2020 targets. It’s commensurate with what the United States is doing and I believe that our focus on climate change through direct action, through incentive rather than punishment with an economy-wide carbon tax is a process that is being appreciated, as we explain it to countries around the world. Did you notice that Bishop does not answer the direct question on climate change and the risk to security? Ms Bishop fails to mention security risk and climate change at all. She should read US Defence Secretary Chuck Hagel on the ‘Threat Multiplier’ of Climate Change, or perhaps this overview from the Climate Council: Is climate change a security threat? The Pentagon thinks so. So let us examine this ‘very good story’. Yes, Australia committed $200million to the Green Climate Fund at the Lima UNFCCC climate negotiations in December. We were one of the last OECD countries to commit to the fund, even behind Canada. But there is more to this story. This money will come out of her Department’s Foreign Aid Budget. While she was announcing the $200 million to the Green Climate Fund at the Lima climate talks in December 2014, Treasurer Joe Hockey announced $3.7 billion slashed from the current Foreign Aid budget in the mid-year economic review. This is on top of $7.6 billion already cut from this budget. Much of this Foreign Aid is used to support programs in south east Asia and the Pacific region including climate adaptation and mitigation. But the Government has got the carbon tax repealed and their Direct Action Plan through for a $2.55 billion Emissions Reduction Fund to ensure they meet 2020 targets. So how ambitious is this target? It is 5 per cent reduction of emissions on 2000 levels by 2020, which was an unconditional offer as part of a target range of 5 to 25 percent made at Copenhagen in 2009. The Climate Change Authority in their March 2014 report said the international conditions had been met to lift our target to 19 per cent. This would not make us a climate leader, merely keep us at our fair share of international climate action. 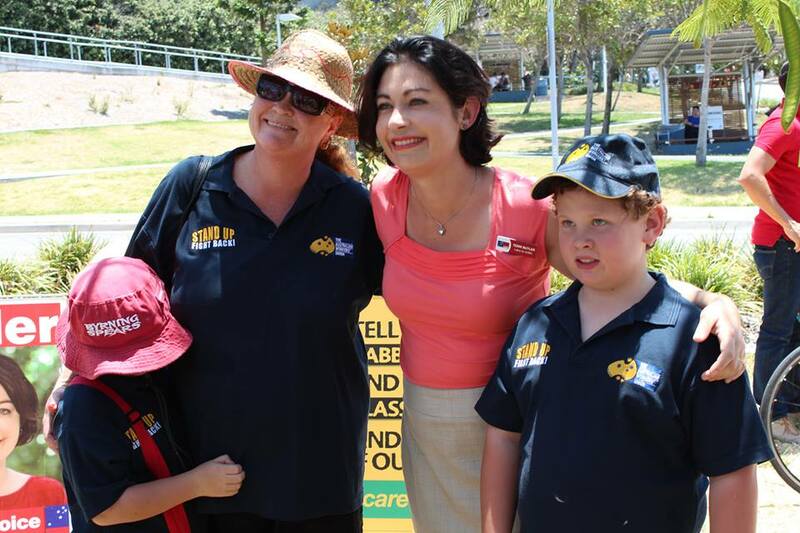 This was ignored by the Abbott Government. Ms Bishop says the carbon tax was ‘economy-wide’ and was punishment, yet on both grounds this is untrue. The carbon pricing mechanism was aimed at a few hundred high carbon intensive large corporations including the high coal dependency electricity sector. Some sectors and specific industries were excluded or given substantial credits. The carbon pricing mechanism was specifically targeted to reducing carbon intensity and emissions – it was far from economy wide. Since the repeal of carbon pricing we have seen a surge in coal generated power while demand is still falling. This strongly indicates that carbon pricing was being effective according to the National Greenhouse Gas Inventory June quarter update report which I reported on in late December: Australian emissions set to soar: new report shows carbontax was working. Both the Climate Change Authority and the International Carbon Tracker team of Climate Analytics and Ecofys say that Australia is unlikely to meet even our present low target. A Reputex report released January 2015 says that Australia will struggle to cut domestic greenhouse gas emissions by just 15 per cent on 2000 levels by 2030 – or 300 million tonnes of CO2e – at a cost of A$10.6 billion. Previous modelling done in 2008 found that Australia could reduce emissions by up to 60 per cent by 2030. 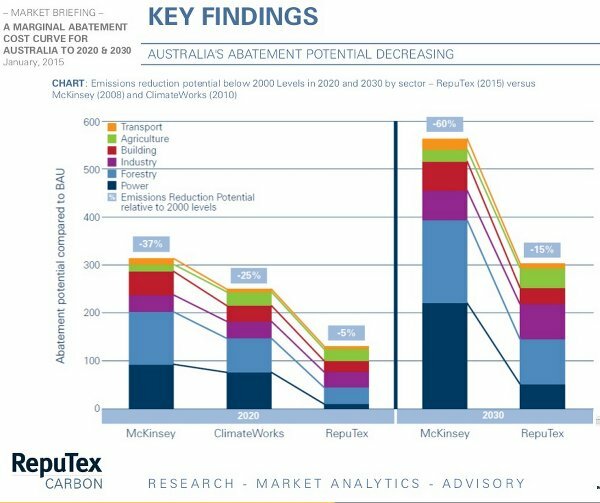 “The new data indicates that a significant portion of Australia’s earlier 2030 emissions reduction potential has been lost due to delayed investment, due largely to policy uncertainty around the carbon tax, and more recently, the renewable energy target” said RepuTex Executive Director, Hugh Grossman. How does Australia compare to the USA and other nations on climate action? 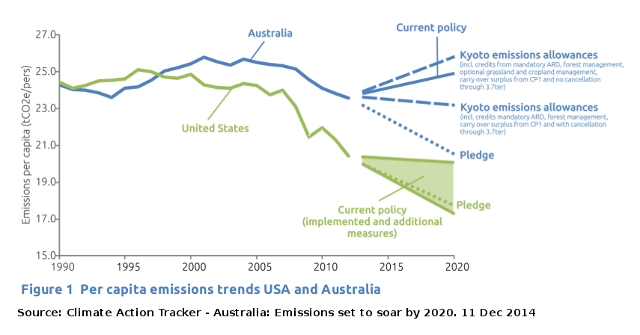 So is Australia’s climate action really commensurate with what the US is doing? The Carbon Tracker team has compared per-capita emissions of the USA and Australia under current policies and found a growing divergence. Australia is proving to be much more a climate laggard than the leadership being displayed under the Obama administration. According to a Sydney Morning Herald report, Australia ranked worst-performing developed nation on climate performance. Ranking second last on the list, only Saudi Arabia was ranked worse at number 58. In terms of renewables investment, funding has all dried up due to the Abbott Government threat to cut the Renewable Energy Target and other climate policies. 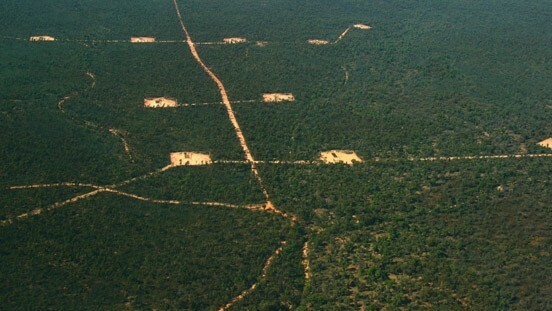 “Australia is dead,” said Edgare Kerkwijk, the head of Singapore-based Asia Green Capital, to the general agreement of all at the World Future Energy Conference meeting at Abu Ghabi, according to Giles Parkinson from RenewEconomy in the article: “Dead” Australian renewables market faces train-crash. Australia is being viewed internationally as a dead weight on climate action. The Abbott Government weak climate policies have sidelined our international diplomatic influence. We talk strong on security and international terrorism but fail to address climate change as the biggest security threat and risk multiplier in international affairs. Thanks Julie Bishop for lying to us again on climate change. Julie Bishop as next Prime Minister? This last week as part of her trip to the USA Julie Bishop had a private audience with News Limited media mogul Rupert Murdoch in New York. 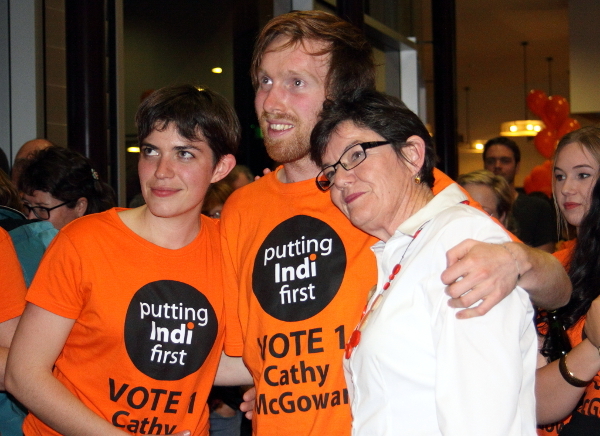 Has she now been anointed as Australia’s next Prime Minister? @CUhlmann did Rupert Murdoch annoint Julie Bishop during her recent visit to the boss? This article really needs wide distribution. Most people I speak to are more concerned with their own little world of everyday concerns,wages,bills, education, health, same old same old. The fact that the effects of a warming World are potentionally catastrophic just doesn’t connect. When assessing political parties, again no thought of insisting on policies to address same is entertained. I am appalled at our present Government’s push for fossil fuels. Of course this is surely due to the powerful influence of the Institute of Public Affairs. This is a Libertarian government with at least 2 or 3 sanators of the same ideology. To me, extremely concerning for our future. With the influence too of Rupert Murdoch,a prominent IPA member, it is nigh impossible to get the sense of urgency out to the general public. Same is happening in the USA with Murdoch and the Koch Bros, both prominent members of a like institute to IPA, being The Heartland Institute. I feel distressed to see the effects, even now, of higher temperatures on our wildlife. In particular birds and frogs. I live in the Tropics, my observations are that there has been a marked loss of frogs. Once I had many, particularly Green & White-lipped, now in late Wet, hardly any. So many more observations but suffice to say, we are feeling the effects and they are devastating. We need a responsible government, which governs for ‘the people’ not BigMoney. There are some very impressive women both in Australia and on the world stage but I am damned if I can find a single one in the whole of the LNP.